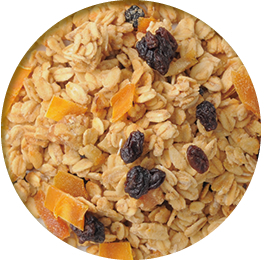 COCOLO KYOTO’s granolas are certified by either Organic JAS, USDA Organic or used no agricultural chemicals and chemical fertilizers. We have other special products that changes with the season. 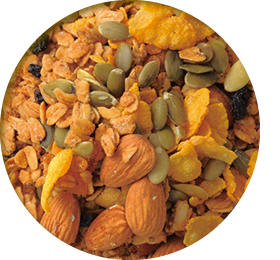 Our very original granola with a hint of chai spice. 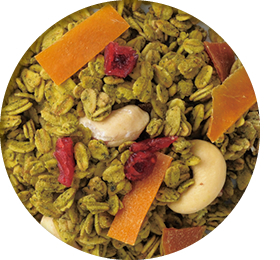 Full blend of dried fruits and nuts. Low GI coconut sugar makes the whole dish enjoyable. You can sense the hint of chai spice with soy milk or milk. Easy to use for pastries and bread. Natural scent and sweetness with full of maple sugar and maple syrup. Low GI beauty food, good for diet, standard flavor good from children to adults. Easy to eat by itself. Good with cream cheese or toast, or simply sprinkle some maple syrup on top. Cocoa, roasted almond, and pecan nuts make a great combination! 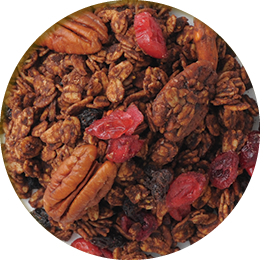 Nuts, dried fruits, cocoa make the perfect anti-aging granola with polyphenol. 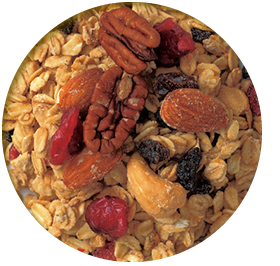 Granola is wonderful with milk and soy milk. Our famous crunchy nuts are good for the ice cream. 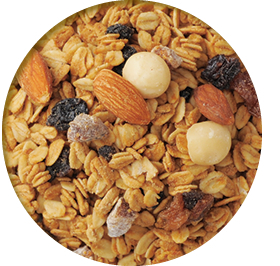 Original Japanese granola used Kyoto’s well-established miso shop “Honda Miso”. We use their white saikyo-miso, yuzu peel, mikawa-mirin, and white sesame for the best effect. Also, walnuts and dried mango are added to make a great blend. Especially good with soy milk. Oatmeal is deeply soaked into white miso and mirin, so you can use it as a topping of ohitashi (boiled vegetable with soy sauce). 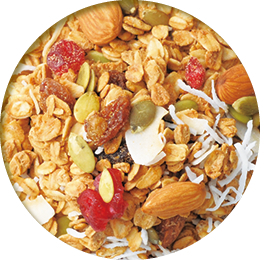 Health-conscious all-coconut granola used coconut oil, sugar, peel, and milk. Coconut is said to be effective for anti-aging. Big sour cherry and coconut are a great match. Burn your fat by eating it with milk, soy milk, or yogurt every morning. Great topping for cinnamon toast. We blend minced sencha and matcha. We made wonderful granola mixing a little bit of bitterness of the tea, soy milk, and honey. Mixed with milk and soy milk, matcha melts into the sauce. That makes it perfect for anko (sweet bean paste), banana, and ice cream topping. These oatmeal and organic cornflake are soaked with organic lemon juice, and grilled with citrus peels. Rich honey adds a natural sweetness. Try it with yogurt salad and cheese cake. 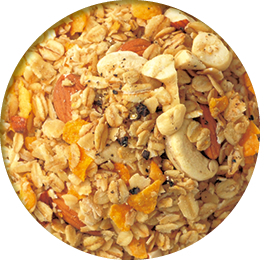 Citrus sour granola’s strong sourness and sweetness will be a great match! Mild saltiness of Japanese traditional sea salt “Umi-no Sei” and crispy olive oil are soaked into oatmeal and organic cornflake to be baked. Cashew nuts and almond make it crispier. Spicy granola with spicy black pepper and original spices. Delicious on green salad and white fish carpaccio with a squeeze of lemon and olive oil. Great on cream cheese along with a glass of wine. Goes well with various dishes.